With over 700 manufactured, Britain's Jet Provost/Strikemaster family saw worldwide service in training and light attack roles. 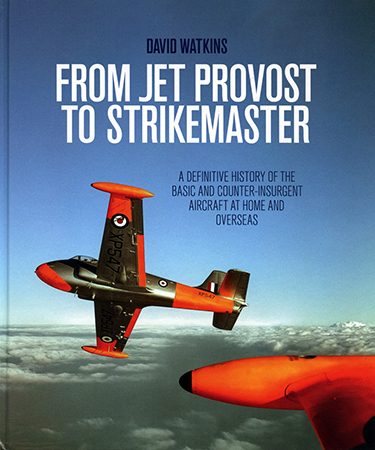 Now – finally, in my opinion – someone thoroughly relates the "definitive history" of this pioneering warplane in From Jet Provost to Strikemaster – available in North America from Casemate. Contents chronologically course through every prototype, production, and proposed version. Airframes. Engines. Equipment. Systems. Armament. Even serials and survivors. Watkins surveys both RAF and export versions – including unit assignments and special formations. Civilian use, too. Personalities, personnel, and personal accounts also augment the account. Prince Charles – the Prince of Wales – even makes an appearance. Anecdotes abound. How about that Arab student who forgot to lower his undercarriage – and thought he made a normal landing? He only sensed his SNAFU when trying to taxi the aircraft – and the beached airframe refused to budge! Hundreds of photos – B&W, color, and close-up – season the study. Modelers will especially appreciate the detail shots and colorful livery. My favorite chapter on the BAC 167 Strikemaster light attack variant alone confirms the stunning swath of schemes. Considering Fly's 1:48 kits? How about Airfix's or Matchbox's 1:72 versions? You'll find plenty of project inspiration here. Two appendices, an abbreviation list, selected bibliography, and index wrap things up. But did the Jet Provost T Mk.51 really carry "eight 500-lb bombs"? And did the same version carry 500 or 600 rounds of machine-gun ammunition? Finally, is this terrific tome really "definitive"? In short, no: absent from coverage, for instance, are official camouflage and markings specifications. Still, publisher hype and reviewer pedantry don't diminish this interesting, informative effort. It earns my robust recommendation. My sincere thanks to Casemate Publishing for this review sample!